The Ventura County Watershed Protection District (WPD) is finalizing a contract with a consulting team to conduct studies to assess the benefits and impacts of the removal of Matilija Dam to the Ventura River estuary and the coastline. 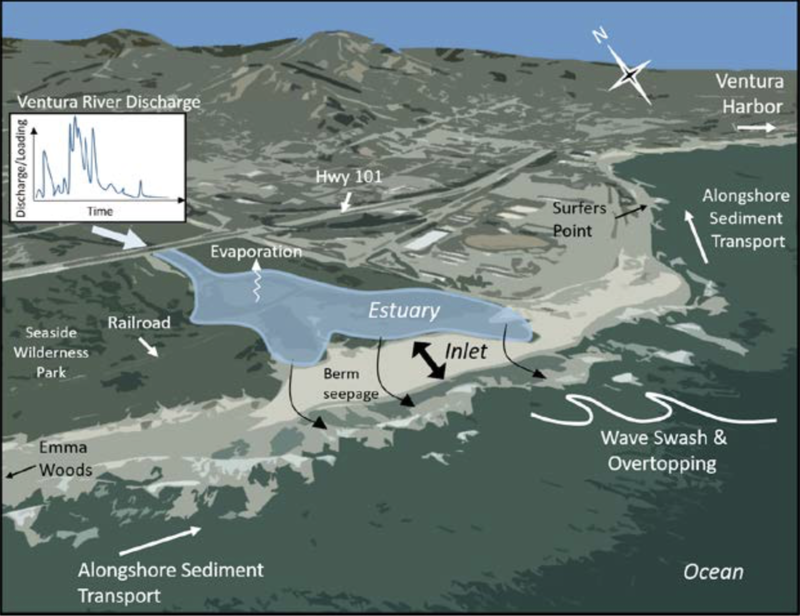 This study will take results from sediment transport modeling to be conducted for the dam removal project to model how this may change the estuary and coast. Previous efforts estimated a 30% increase in coastal sediment delivery over the 50 years following dam removal. This study will take a more detailed look at where this sediment will go and how it will affect the coastal ecosystem. The consultant team was chosen through a selection committee convened by the Watershed Protection District to review proposals and conduct interviews. This work is funded through a grant from the National Fish and Wildlife Foundation and is anticipated to be conducted from October 2018 through September 2019. The study area includes the Ventura River starting at the West Main Street Bridge in the City of San Buenaventura and extending south to the mouth of the river at the Pacific Ocean, thence to the nearshore coastal areas from the Emma Wood State Beach extending east to the Ventura Harbor. The modeling of sediments delivered to the Ventura River Estuary and nearshore waters is an integral component of the larger Matilija Dam removal project, which is intended to restore riverine processes to create and sustain a variety of instream, riparian, estuarine, and coastal habitats along 16 miles of the Ventura River, including the estuary and immediate nearshore waters, as well as migratory access to upstream habitats for the federally listed endangered southern California steelhead trout. A restored sediment regime will enhance habitats for a wide variety of other native species such as the federal endangered tidewater goby and federal threatened red-legged frog, as well as other state and federal endangered riparian species such as the least Bell’s vireo and southwestern willow flycatcher. Sediment delivered to the immediate nearshore inter-tidal and sub-tidal marine environment is also an important component in these coastal habitats supporting spiny lobster, brant, western snowy plover, California least tern, and legless lizard as well as a larger number of marine invertebrates (e.g., clams, mussels, anemones) and plants (surf grass, marine algae). • A shoreline model to evaluate long-term sediment transport patterns. The coupled model will provide predictions of temporally and spatially resolved sediment transport and sedimentation within the Lagoon as well as short- and long-term predictions of shoreline change. These model outputs will then be used to assess the impacts on Lagoon and coastal habitat.